The Western States Endurance Run was first completed in 1974 by Gordy Ainsleigh. Ainsleigh had finished the Western States Trail Ride (Tevis Cup) in 1971 and 1972 on horseback, but in 1973 his new horse was pulled with lameness at the 29-mile checkpoint. 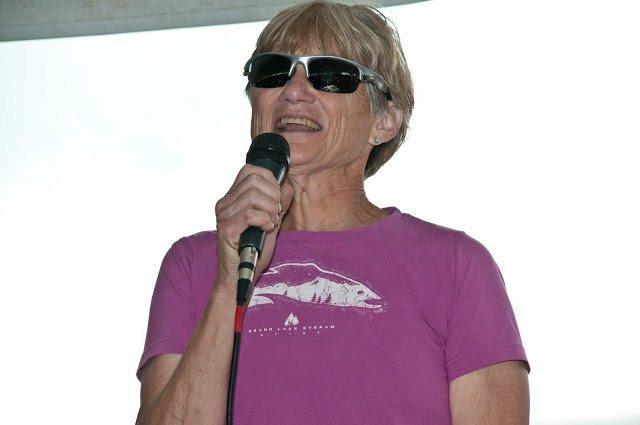 In 1974, with the inspiration and encouragement of Drucilla Barner, first woman to win the Tevis Cup and Secretary of the Western States Trail Foundation, Gordy joined the horses of the Western States Trail Ride to see if he could complete the course on foot. Twenty-three hours and forty-two minutes later Gordy arrived in Auburn, proving that a runner could, indeed, travel the 100 miles in one day. In 1977 at the pre-ride briefing of the Tevis Cup 100 mile ride in Squaw Valley California Wendall Robie in his how it all began speech made mention of the Green Mountain Horse Association and their 100 mile event that began in 1936. This inspired a rider from the Woodstock Vermont area. When Steve Rojek got back to South Woodstock he was determined to have a Tevis like ride here in Vermont. Riders Betsy Cook and Sonny Holt and Steve along with Cornell Veterinarian Dr. Steve Roberts made it happen in 1980. 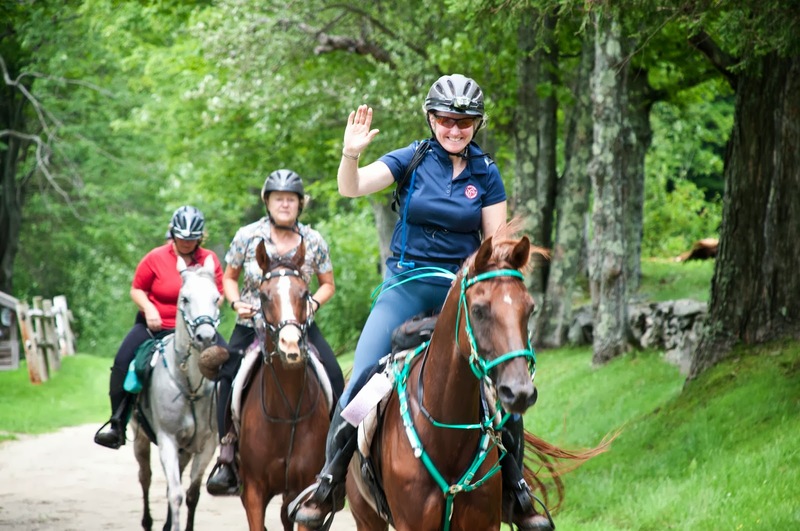 For the first 3 years the ride was held in Pomfret at Bill Emmons’s Cloudland Farm and attracted riders like Dr Matthew MacKay Smith, Maggie Price, Valerie Kanavy, Nancy Beacon, Robin Culver (now Groves). The ride was not held for a couple years because riders were not pre-entering and the volunteer workers felt it was too much work to do not knowing if riders were going to show up. Then in 1985, The Rojeks hosted the ride at their Smoke Rise Farm where it was held until 2004. Endurance rider Laura Farrell from Brownsville Vermont decided to run the Human 100 mile marathon at the Old Dominion in Front Royal Virginia winning the fastest woman award. Laura was hooked and approached me with the idea of combining our Equine 100 mile event with the Human 100 mile marathon and I thought that would be great. The year was 1988 and the event would be a benefit for the Vermont Handicapped Ski and Sports Association (now Vermont Adaptive) a very worthwhile and appropriate organization. Gordy Ainsleigh came to Vermont to run in 1999. Tevis, Old Dominion and Vermont were three events that had horses and runners on course at the same time. 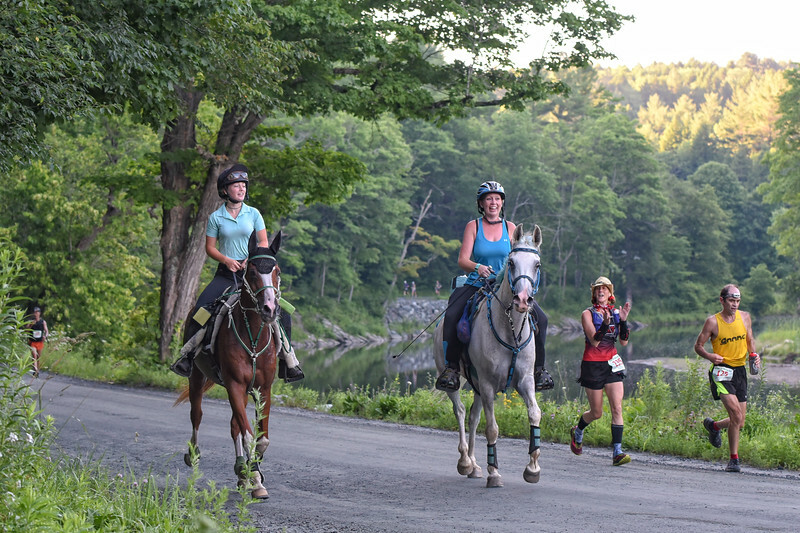 Eventually The Old Dominion and the Tevis ride/run split into two separate events leaving the Vermont 100 the last and only event with horses and runners competing on the same trail. For many years, at Smoke Rise Farm, the Rojek’s had Tuxedo clad piano player (Ed Chenoweth) playing “Chariots Of Fire” under the light of a Liberace like candelabra beginning at 4 A.M. for the start of the run and again at 5 A.M. for the start of the horse endurance ride. There were fireworks off in the distance announcing the start of each event as well. The night before was a sit down supper in the indoor arena for participants and their crews and the volunteers. Then on Sunday the Hartland Volunteer Fire department put on a Chicken Barbecue for the same group before the completion belt buckle awards were given out. In 2004 the ride venue was moved just up the road to Jose Bernatchez’s Silver Hill (where the race has been held since) where her big field was perfect for horse rigs and Tents. Sue and John Greenall worked so hard to put on a class act for everyone involved. Managing Volunteers and there are so many, getting permission from so many private land owners along with hiring Veterinary judges and marking trails is a monumental task. Sue and John are unsung heroes in my book.